All Posts Tagged With: "Hairdryer"
For 2010 Oscar night, Cameron Diaz wore an elegant metallic Oscar de la Renta gown and a luminous hair look reminiscent of the Old Hollywood glamour of Veronica Lake – created with a modern point of view by stylist Lona Vigi. How to get Cameron Diaz’ Oscars 2010 hairdo: Vigi started by spraying on a volumizer, then used the high-tech Velecta Paramount Paris TGR 4000i hairdryer to create texture and shine in a unique way. 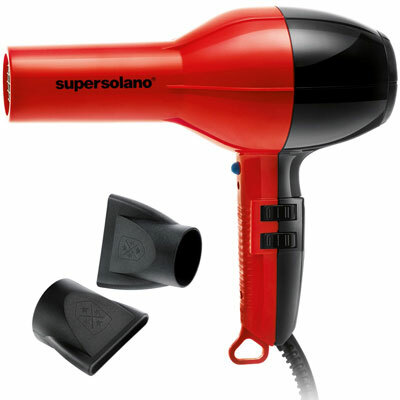 The dual-function French-made dryer is built with the ability to turn an ionics switch off to build volume, and then back on to create shine and smoothness. She first blow dried the hair with ionics turned off, volumizing by taking small sections of hair and using a medium round bristle brush to dry the hair back and up using high velocity and heat. Vigi then “set” the hair and gave it a boost of shine by turning on both the ionics switch and cool button to lock in curls and add a polished shine. She then freed the barrel curls and held each one in place with a pin.